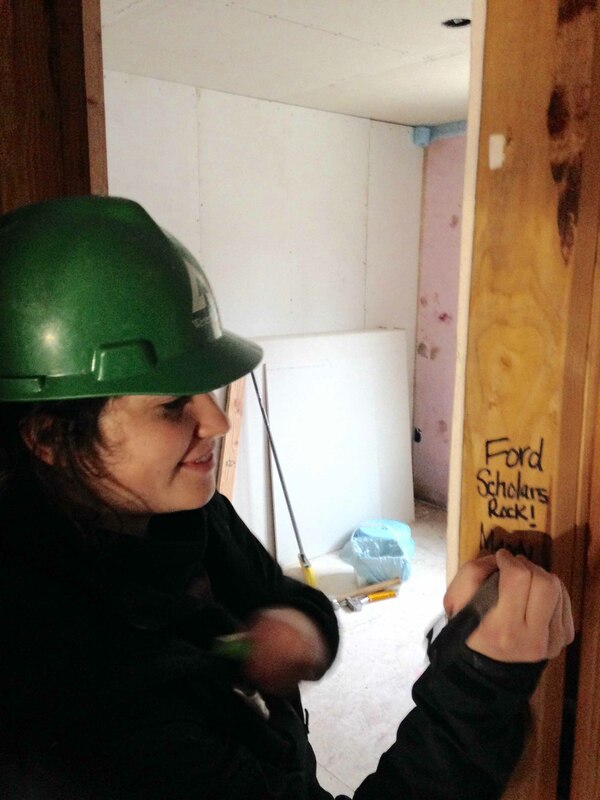 Ford Scholar Alumni rolled up their sleeves and went to work in their own communities during Martin Luther King, Jr. weekend, as a way of serving others and living out Kenneth Ford’s legacy. Ford Scholar Alumni Association Member at Large Marshall Curry thought more alumni could participate in community service projects if there were several events happening across the state. FSAA Vice President Kirsten Yamada coordinated the Portland-area MLK event with Willamette West Habitat for Humanity on Saturday morning, Jan. 17 in Beaverton. The organization helps foster home ownership for low-income families and improves the community by building affordable, energy-efficient housing and family-friendly neighborhoods. Ford Scholar Alumni helped alongside other volunteers with a variety of projects, including painting the inside of several rooms and putting up dry wall. “We had a blast! And it was so much fun to work side by side with other Ford Scholar Alumni—learning new skills, and most importantly helping a family in need,” Yamada said. Rebecca (Sullivan) Fallihee from the Class of 2005 coordinated a work party at Lincoln Elementary School Garden in Corvallis on a rainy Saturday morning, Jan. 17. The Lincoln Garden is managed by the Linus Pauling Institute’s Healthy Youth Program at Oregon State University. Teachers use the garden to integrate garden learning into their classroom curriculum; increase food literacy; provide new food experiences to students; encourage them to taste fresh produce; teach children about the importance of making healthy food choices; and increase student’s connection and relationship to nature. Fallihee and FSAA President Mary Chuinard and her family pitched in to help along with eight OSU Ford Scholars. They weeded and mulched garden beds and pathways. “It was quite rainy, but everyone stayed in good spirits and was excited to be there,” Fallihee said. Holly Scholz from the Class of 1998 helped provide five energetic Ford Scholar volunteers to set up for the Martin Luther King, Jr., Celebration, March and Student Contest, held Monday, Jan. 19 at Springfield High School. Scholz and the University of Oregon Ford Scholars spent the morning hanging student artwork and decorating the commons area for a reception. Rasubala was there with his Ford Scholar mentee, UO journalism major Lizbeth Silva from the Class of 2013. “I wanted to be more involved,” Silva said. “Since it’s my day off, I decided to do something productive.” Silva’s twin sister, Lizeth, also a Ford Scholar, pitched in. 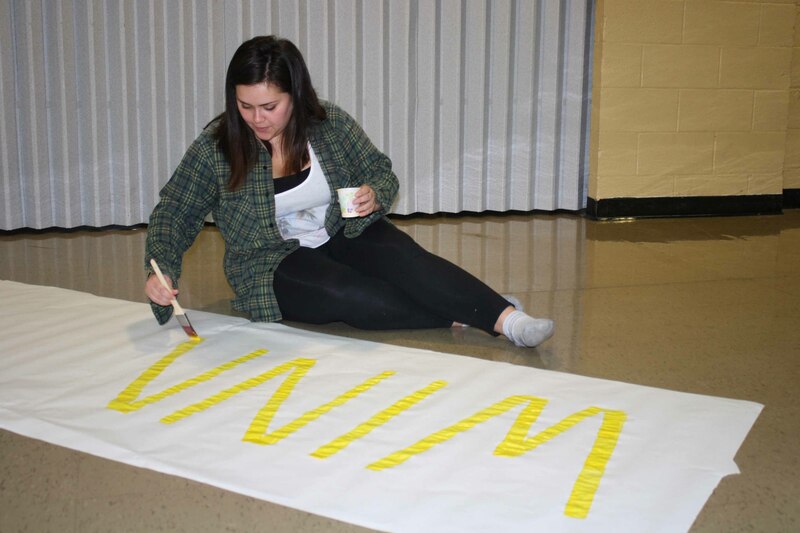 UO art major and Ford Scholar Robin Hill from the Class of 2011 enjoyed using her talents to paint a banner that read “Winners” to showcase the winning students’ artwork. “I stand for what Martin Luther King, Jr., stood for,” Hill said. She later joined community members in a peaceful MLK march. Not only did Curry oversee the state-wide FSAA events, he also helped coordinate alumni and Scholars to help with the MLK Celebration Stride Toward Freedom 5K Run/1 Mile Run/Walk, which was held Saturday morning, Jan. 24 at Willamette University in Salem. Curry, from the Class of 2009, Nelya Drofyak from the Class of 2005 and their friend Kendra Schaffer, helped set up tables and chairs; welcome runners to the start of the course; answer questions; work as gophers; and cheer on the runners. Aimee Fritsch, a Class of 2010 alumna who lives in Minneapolis, Minn., joined the Hockey Day Minnesota at Holeman Field in St. Paul, Minn., on Saturday, Jan. 17. “In the winter, in the great state of Minnesota, they host a hockey tournament, on an airport tarmac, that is simultaneously broadcast to the Minnesota National Guard stationed in Kuwait,” Fritsch explained. Hockey Day Minnesota benefits St. Paul-based youth hockey programs. Conor Sullivan, one of Fritsch’s fellow Jesuit Volunteer Corps members, joined her in volunteering at Hockey Day, serving concessions to feed spectators and athletes. Before the project began, Curry’s goal was to recruit five coordinators and organize three MLK Day of Service projects across Oregon. He recruited eight coordinators who put on five events – four in Oregon and one in Minnesota. Curry is excited to see how the FSAA continues the momentum into Earth Day events this April by surpassing the goals he has set – five events, 10 coordinators and 10 new connections. Alumni have already stepped up to help coordinate events in Clackamas, Redmond, Salem and Springfield. 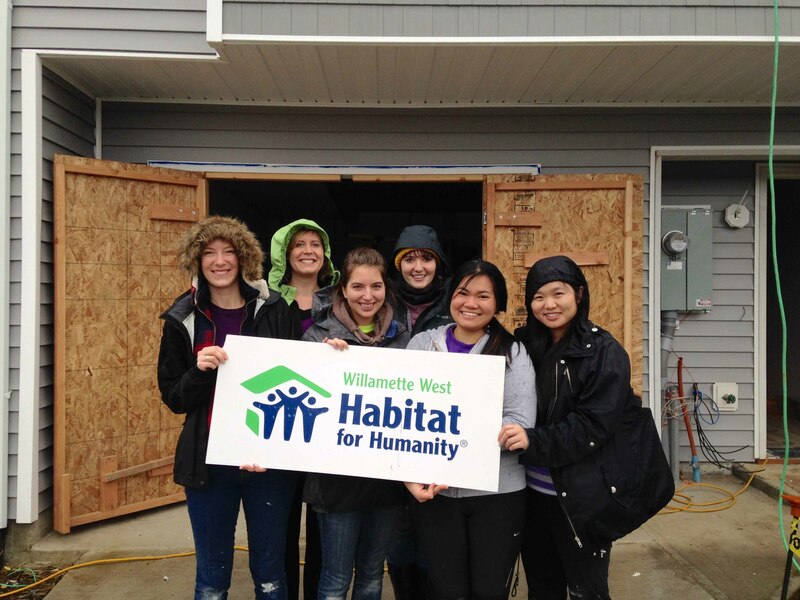 Ford Scholar Alumni pitched in to help Willamette West Habitat for Humanity build a home in Beaverton, Ore., on Jan. 17. Michelle Bolduc Culaba (2006), Kirsten Yamada (2005), Emilie Jensen (2009), Mandy Elder (2009), Van Duong (2006) and LeHua Amy Chen (2009). 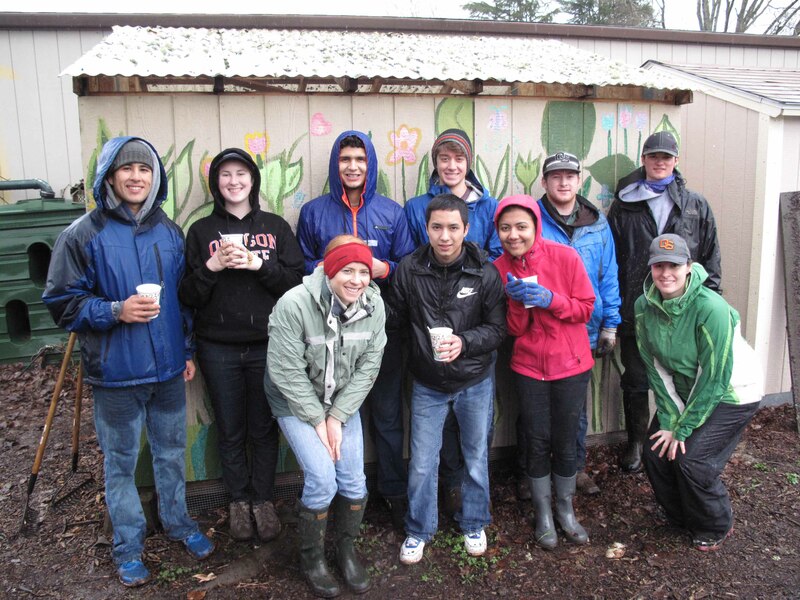 Ford Scholars and Alumni worked in the Lincoln Garden in Corvallis on Jan. 17. Back row: Martin Sanchez (2011), Shelby Lofton (2013), Josue Gonzalez (2012), Wiley Wolfe (2013), Garrett Robinson (2013) and Tim Messner (2013). Front row: Rebecca Fallihee (2005), Hai Dao (2013), Swechya Banskota (2013) and Mary Chuinard (2002). 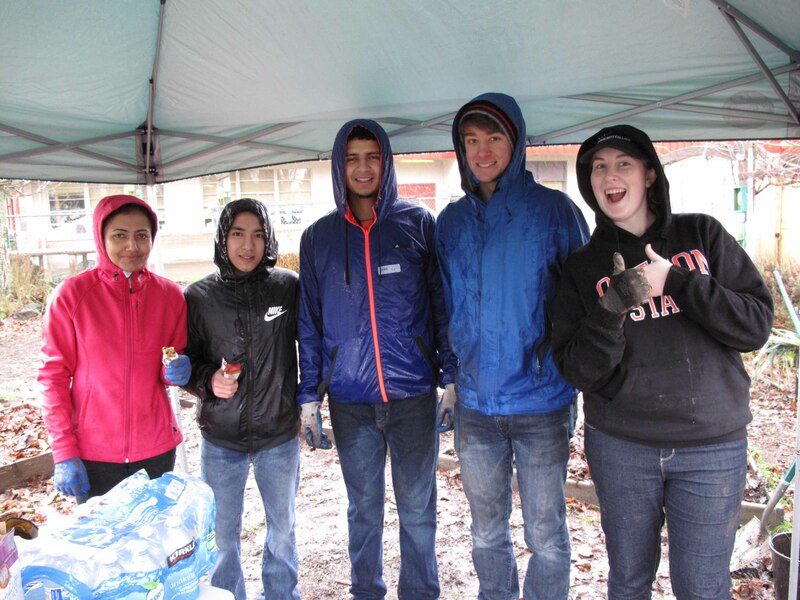 Oregon State University Ford Scholars Swechya Banskota (2013), Hai Dao (2013), Josue Gonzalez (2012), Wiley Wolfe (2013) and Shelby Lofton (2013) braved the rain to help weed and mulch garden beds and pathways at Lincoln Elementary School Garden in Corvallis on Saturday morning, Jan. 17 as part of MLK Weekend of Service. University of Oregon Ford Scholar Mentor Rian Rasubala (2012) helps his mentee, Lizbeth Silva (2013), hang a poster of student artwork for the MLK Celebration in Springfield on Jan. 19. Ford Scholar Robin Hill (2011) paints a sign during the MLK Celebration in Springfield on Jan. 19. Hill is an art major at the University of Oregon. 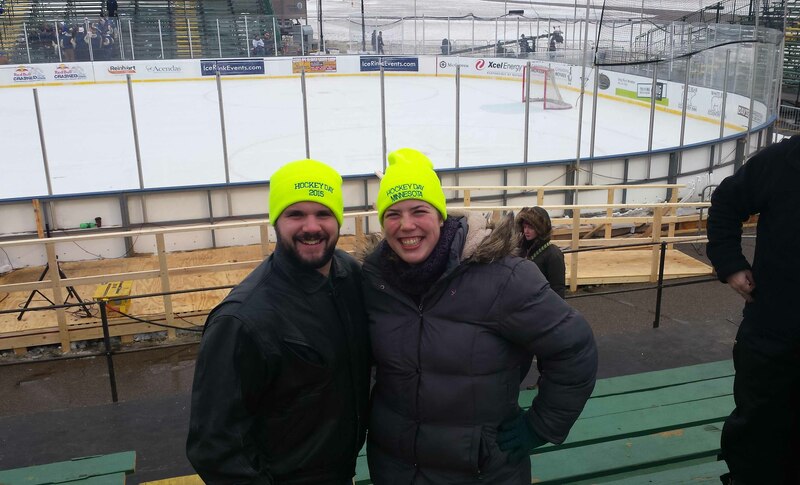 Conor Sullivan and Aimee Fritsch (2010) volunteered at Hockey Day Minnesota in St. Paul, Minn., on Jan. 17 during MLK Weekend of Service.